Waves are generated by local winds. Swells are waves generated, typically, by winds of distant weather systems where the waves have undergone dispersion and have transformed into groups of waves of roughly the same period and height by the time they reach your location. Finally, Seas are a combination of waves and swells superimposed on one another. The higher the wind speed, the higher the waves. The longer the wind blows, the higher the waves. The greater the distance over which the wind blows (Fetch,) the higher the waves. So just what is NOAA Weather Radio telling us when they give us wave heights during the marine forecast? The first thing when listening is to determine if they are talking about waves or seas. Often times both are used in the same area forecast and as noted above, there is a difference. and then there is the "rogue" wave of an even greater ratio and no one seems to want to speculate when that might occur. 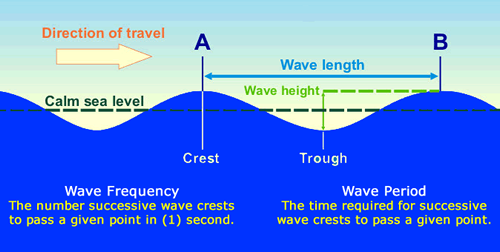 A wave greater than 19 feet will occur every 8,000 seconds (2.2 hours). As you can see even with wave forecasts of a specific height, larger waves should always be expected. Actual water depth can often be reduced by as much as half of the wave height. Let’s take a look at an example using a 6’ wave in a water depth 10’. In the case of a 6’ wave, the bottom of the trough could reduce the normal water depth by as much as 3’. So what exactly does this mean for the mariner? For a vessel drawing 5½’ running 20 miles offshore in 100’ of water, it is likely of no consequence. However, what about when you are in much shallower water say 10’ deep? With a 5½’ draft under calm conditions you have 4½’ of water under the keel. What happens if a 6 footer happens to roll by reducing the water depth by 3’ at the bottom of the trough? In that case you are still good right? While it is likely that by this time these waves are breaking, you still have 1½’ under your keel. Now, again presuming that the Rayleigh Distribution Model above is correct, then 1 in every 100 waves is likely to be 10’ or larger; that changes things significantly. Just something to consider when running in shallow waters in heavy weather.